Enjoy your complimentary stay at the Hilton St. Louis at the Ballpark. The evening is yours to get self-acquainted with the local attractions of St. Louis. Our Hospitality Desk will be located in the hotel for your convenience between 2:00 p.m. and 7:00 p.m. It is here that our friendly staff can assist with everything from general questions about your upcoming voyage to reserving Premium Shore Excursions. An American Queen Steamboat Company representative, as well as a local representative, will be readily available to provide you with dining, entertainment, and sight-seeing suggestions so that you may maximize your time in St. Louis. Explore St. Louis at your leisure or consider a Pre-Cruise Premium Shore Excursion with afternoon transfer to the American Queen. Hannibal, Missouri has a rich history, diverse industrial economy, and truly remarkable arts. The city was founded in 1819 by Moses D. Bates and became a popular stop along the river for many steamboats traveling up the Mississippi River. Hannibal offers more parks per citizens than most towns in the Midwest and was included in the famous “50 Miles of Art.” Today, the most popular draw of this quirky town is Hannibal’s very own Samuel Langhorne Clemens, recognized world-wide as Mark Twain. Many of the popular characters featured in Twain’s novels were based on people Clemens had known while growing up in Hannibal. Many of the characters and influences of this American icon are weaved into the streets, shops, restaurants, and museums of Hannibal waiting to be uncovered. Embark on a journey back in time when the steam coach stops at the Big River Train Town Model Train Museum. Here’s we will embrace the golden age of railroading. This Hannibal gem is packed with more toy trains than you have probably ever seen. Enjoy authentic replicas as they move swiftly along the tracks or learn the history of the models and the trains they are made after. As you walk around, relive your childhood and learn the stories of the railway’s past as you view some authentic memorabilia. Learn everything there is to know about this literary icon. The mission of the Mark Twain Home Foundation is to promote awareness and appreciation of the life and works of Mark Twain and to demonstrate the relevance of his stories and ideas to citizens of the world. This included tour visits eight buildings, six of which are listed on the National Register of Historic Places and two that are highly interactive museums showcasing fifteen original Norman Rockwell paintings! Learn about the Hannibal of Samuel Clemens’s childhood and explore the stories created through the powerful imagination of American icon, Mark Twain. Building 1: Interpretive Center – Here, explore interactive exhibits highlighting the stories and life of Samuel Clemens. Building 2: Mark Twain’s Boyhood Home & Garden – See the home where Clemens was raised, and where the adventures of Tom Sawyer took place, along with the home’s lovely gardens. Building 3: Boyhood Home Gift Shop – The original museum which was built in 1937 and goes even further into the life of Clemens. Building 4: Huckleberry Finn House – The childhood home of the real Huck Finn, who goes by the name, Tom Blankenship. Building 5: Becky Thatcher House – The home of Laura Hawkins, the inspiration for Becky. Building 6: J.M. Clemens Justice of the Peace Office – The location where Sam’s father held court. Building 7: Grant’s Drug Store – The location where the family lived briefly and where John Clemens died. (Display through window). Building 8: Museum Gallery – This lovely 2-story building features interactive exhibits, the Norman Rockwell Gallery, and treasured Clemens family artifacts. Live performances are played throughout the day at specific times. Tom & Huck Statue – Located at the foot of Cardiff Hill and offers a perfect location for a photo! A stunning historical church in the heart of Hannibal featuring beautiful interior and exterior decorations and architecture. For more than 150 years, the Sanctuary of Trinity Episcopal Church, designed by architect Joseph A. Miller, has stood the test of time. With an interior consisting of a deeply arched heavy wooden beamed ceiling, beautiful bronze lanterns and side wall lamps, an impressive pipe organ and 18 illustriously conceived stained glass windows, Trinity Church is truly an historic marvel. As you step into the church, you are immediately transported back into time and enveloped by Hannibal’s past. Early church members commissioned well-known artists to design the Sanctuary’s beautiful stained glass windows. With signature designs by Charles Booth, Emil Frei, Jr. and the Louis Comfort Tiffany Glass Company, these windows are truly remarkable in their diverse artistic style, thematic construction and conceptual execution. Hear the history of this historical town along the Mississippi. View artifacts, photos, and exhibits explaining how the city evolved to where it is today. There is always plenty to do between dawn and dusk on the river and today is the perfect day to enjoy the many public spaces and activities that are available to you onboard. Consider booking an indulgent, stress-relieving massage in the American Queen's spa. Browse The Emporium gift shop for that perfect keepsake, or take the time to mingle with fellow guests. The city of Clinton has much to offer, all with the beautiful backdrop of the Mississippi River. Situated at the crossroads of the Lincoln Highway and the Great River Road, Clinton is the Eastern-most point in the state of Iowa. At the height of its local economy during the late 19th Century, Clinton was regarded as the lumber capital of the nation; a history that is reflected as visitors pass many old sawmills. Today, agriculture plays a big part in Clinton’s economy, which is visible in the beautiful rolling fields filled with luscious, fresh harvest crops. Explore the history of this fascinating river town and discover a lifestyle that will stand out from today’s norm! Explore the history of Clinton’s historical Courthouse. Discover artifacts, articles, and photos depicting the stories of the structure and admire the architecture of this Clinton treasure. Walk through the Windmill Cultural Center, as you explore the different styles of windmills with impressive replicas and learn about the history and importance of the windmill throughout the century. The Windmill Cultural Center was dedicated in April of 2010 and showcases 22 European windmills, varying in sizes up to six-feet tall. The windmills can be traced to Belgium, Denmark, England, Finland, France, Germany, Greece, Ireland, Portugal, and The Netherlands. Their different backgrounds gives each windmill its very own unique design, demonstrating the culture and heritage of each country. Located inside the Windmill Cultural Center, a charming gift shop is available for guests, where unique gifts like fresh stone-ground flour, Delft pottery, and windmill souvenirs can be purchased. Discover Clinton’s past as you walk around this museum highlighting the city’s first source of large economic income – lumber. Hear the history of the town and the struggles to get on their feet and how, with the help of lumber, the town began to flourish. Lumber was an essential resource in the city of Clinton, not only for construction of buildings and barns, but also contributing heavily to the industry that brought the railroad, the immigrants, and the entrepreneurs. Here, discover the stories that made the lumberjack a national hero, then experience what life was really like in a lumber camp. Hear the buzz of the saw mill as logs are cut into lumber and envision the workings of the Struve Mill where hundreds of pieces of wood became beautiful trims, doors, and flooring. On this guided tour, explore this beautiful mansion that has been listed on the National Register of Historical Places. Indulge in wine tastings on this relaxing and beautiful visit to one of Clinton’s historical mansions. This restored Victorian home of lumber baron George M. Curtis is a prime example of period architecture with its original Tiffany glass windows, delicately carved banisters, ornate wood trim, and massive fireplaces. Rich in the history of the area, this mansion makes an elegant backdrop for special events. It is listed on the National Register of Historic Places. The tour of the Mansion will end with a sampling of local Wide River Wines on the wrap-around front porch. Since its establishment in 1946, the Clinton County Historical Association and Museum has established a collection of over 30,000 artifacts from Clinton County. The museum has impressive collections of Redford Glass, rare and valuable pieces for collectors across the country, as well as a large collection of Native American relics, including more than 1,000 artifacts. Exhibits and galleries take up two floors of the building and display local art, Civil War artifacts and history, Native American Settlement, antique musical instruments, and much more! After exploring the expansive and incredibly fascinating and interactive museum floors, guests can stop into the gift shop, where an assortment of local historical books, prints, and souvenirs can be purchased! Bask in the beauty of light filtered through 101 Tiffany stained glass windows, all of which are original pieces created by Louis Comfort Tiffany (from New York City). They have been fully restored to allow for intense, vibrant colors. This beautiful Romanesque style church is characterized by thick walls, heavy columns and round arches for windows and doors. On foundations 32 inches thick, the walls are built of enduring Bedford limestone from Indiana. Each stone was cut by hand and if one looks carefully, imbedded fossils may be seen. Inside, the original organ from 1897 has been restored and is once again functioning, murals are displayed, and impressive woodwork. The church is most noted for its large collection of Tiffany stained glass windows, which has been called, “one of the five finest Religious Tiffany Collections in the world.” Explore the history and art of the church as an expert guide chauffeurs guests through the expansive church explaining some of the most interesting facts. Enjoy a view of the Mississippi River and downtown Dubuque on the Fenelon Place Elevator, also known as the Forth Street Elevator. The funicular railway is claimed to be the shortest and steepest railroad in the world. The Fenelon Place elevator is described as the world's shortest, steepest scenic railway, 296 feet in length, elevating passengers 189 feet from Fourth Street to Fenelon Place. The railway was constructed in 1882 for the private use a wealthy local banker and the former state senator. Where you will see a view of the historic Dubuque business district, the river and three states. Experience this remarkable boutique hotel, offering the area's most elegant accommodations and impeccable service. After a $30+ million complete renovation, the Hotel Julien Dubuque is now a true landmark of luxury and sophistication. The hotel's contemporary elegance and sumptuous comfort complement the grandeur of the historic Old Main District The original structure, four stories high, was called the Waples House and was named after its owner, Peter Waples, a wealthy Dubuque merchant. It was the first building visible to the travelers entering Dubuque from across the Mississippi. The Waples House was furnished extravagantly and was known far and wide for its gourmet cuisine. Now 170 years later, after a $33 million interior renovation and exterior restoration, Hotel Julien Dubuque has redefined elegance through the blending of its rich history with modern luxury and style. This impressive opera house was built in 1889 for $65,000. At this time, it was the largest theater ever to be built in the city of Dubuque and over 2,600 live productions were performed at the theater. Dubuque's historic Grand Opera House is the oldest and grandest of more than 16 legitimate theaters which served the community prior to 1900. In 1889 W.L. Bradley, Jr. and other local businessmen invested $100,000 to create this iconic landmark of Dubuque culture. The architect Willoughby Edbrooke selected the Richardsonian Romanesque style and chose red sandstone and Dubuque brick for construction. The 1,100 seat auditorium included two balconies, eight boxes and stalls and a proscenium large enough to host major theatrical productions. Today, the theater is still used by the community and the productions continue to delight the viewers. As a prime example of Egyptian Revival style, the Dubuque County Jail is one of three of its kind still standing today. It is famous for having once hosted Butch Cassidy, who was detained here for a mere four hours. The jail was built in 1857 and is a rare example of Egyptian revivalist architecture. It is listed on the National Register of Historic Places and is also an official National Landmark. The Old Jail Museum exhibits some of the Dubuque County Historical Society's most unique and interesting artifacts. It's one-of-a-kind collection pieces include the Julien Dubuque family cradle, a passenger wagon from the Dubuque-based A. A. Cooper Wagon Works company dating back to the 1860s, the ACME Life Saving Device that saved 27 people from the 1946 Hotel Canfield fire, and a Civil War flag. The Old Jail also features a light and sound show, "The Hanging of Patrick O'Connor", which tells the story of how O'Connor was condemned and hanged for the murder just 20-yards from the jail. 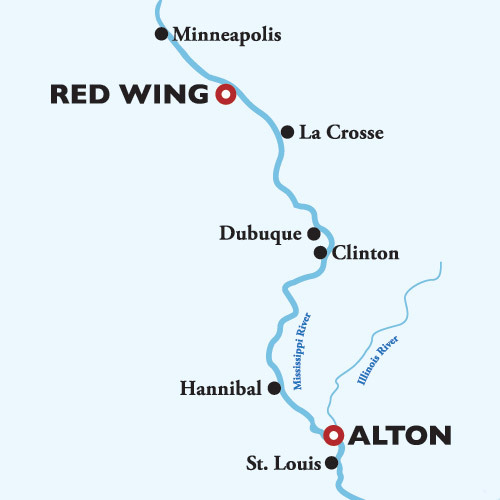 La Crosse, named by explorer Zebulon Pike who saw a group of people playing a game with sticks that looked like a cross, is a popular destination for tourists. Filled with statues, architecture, and an exquisite view of the river, this river city is an artist’s dream. Like much of Wisconsin, La Crosse became heavily involved with the lumber industry in the mid-1800's until the decline of the forests throughout much of Wisconsin took its toll. But in the wake of the vanishing lumber era, La Crosse became a city renowned for its beer making, with around five breweries operating in La Crosse near the turn of the century. Today, make note of lingering pieces of history along the streets of the city, inside local breweries, and within the floorboards of historic homes and businesses. View antique cars and learn about the Ford Motor Company and its five generations of history through their automotive journey since 1911. The Dahl Auto Museum celebrates the Dahl family's involvement as automotive dealers spanning over 100 years and 5 generations. It also features the history of the automobile through the eyes of Ford Motor Company, an extensive mascot collection and many beautifully restored classic automobiles from the turn of the century to present. Approximately 20 antique and classic cars are on display to highlight each decade from Dahl Automotive inception in 1911. To incorporate historic La Crosse, the museum also features a re-creation of the Starlite Drive-in Theatre. A beautiful historic Romanesque-style house of worship. It has been open since 1871. The shape of this immense and beautiful chapel symbolizes attributes of God. The high ceilings represent a God who transcends the finite world while the shape of the nave, transepts and sanctuary form a cross, acknowledging an immanent God who has been with humankind even through suffering and death. At the entrance of the chapel, just above the door, a relief of Moses before the burning bush is showcased. Admire bronzed statues, symbolic paintings and sculptures, stained glass windows, and mosaics. A beautiful look back in time at an authentic Victorian home. Built in 1859, this Italianate house features beautiful woodwork and lavish interior decoration. With approximately 90% of its original furnishings, the Hixon House is a unique historical home truly representative of its era. This beautiful Victorian house is filled with nearly all of the original furnishings, making it stand out from many other historical homes. The construction of the home began in 1859 by lumber baron Gideon Hixon, who featured beautiful woodwork and ornate interior decoration. His wife, Ellen is responsible for the decoration of the home, who chose the Aesthetic fashion style, accenting rooms with “Turkish Nooks.” It is listed on the National Register of Historic Places. Visit the Riverside Museum to enjoy exhibits that explore the chronological history of La Crosse. Riverside Museum exhibits chronicle the history of La Crosse, concentrating on the Mississippi River and its importance to the area. Exhibits range from prehistoric artifacts to a large collection of birds and fresh water clams. A video of the history of La Crosse is shown and artifacts of the steamboat “The War Eagle” are on display. On display here guests will find an expansive art gallery from American Folk art to international pieces by Monet, Renoir and Van Gogh. This nonprofit art museum and educational center opened in July of 2006 to help showcase and recognize the Winona area for their culture and art. When they initially opened their doors, the museum featured a collection of traditional marine paintings and folk art. Today, the museum holds pieces of art that travel through the history of America and Europe including styles such as, Impressionism, Luminism, Realism, Modernism, and Contemporary. The country’s largest county historical society. Here, guests can explore a wide variety of exhibits ranging from historical simulated Main Street America to the Time-Line exhibit which encompasses the entire 2,500-square-foot balcony and covers the history of the area from its bedrock foundation to the first human habitation. Explore Winona's rich history and shop for local gifts. The History Center is made up of Winona's 1915 Armory and the award-winning contemporary Laird Norton Addition. Step back to when the bluffs were formed and travel through time when Winona was a booming lumber town to the arts and cultural center it is today. Artifacts on exhibit include a large selection of Native American objects, the ballot box Winonans used for electing Lincoln as president and many other treasures. Three floors of exhibits and a vast research archives hold the area's amazing past. The Museum Shop features many river related, Winona and Minnesota gifts and items created by local artisans. This Winona landmark is clad inside and out with regal finishes, with a marble rotunda, Tiffany-style glass and a freestanding dome covered with 24-karat gold leaf. Watkin’s company began in 1894 selling products such as J.R. Watkins Liniment, which was their very first and most popular. The company was noted as the very first business in America to offer the famous, “money back guarantee” in 1869 as Watkins made most of his sales door-to-door. Explore the Watkins’ museum and store and get a glimpse of the history from the company’s perspective spanning more than 140 years. Walk around and discover photographs, articles, artifacts, and memorabilia before strolling through their gift shop offering more than 350 unique Watkin’s products that have stood the test of time. This 1890’s, three-story building was originally intended to be a museum storage area but stands today as a museum of Polish immigrant history. This three-story museum was constructed in 1890 and purchased by Reverend Paul J. Breza in 1977, with intentions to begin the Committee for Polish Affairs. After losing their initial parent funding business, the museum renamed itself the Polish Heritage Society and worked diligently to share the stories and history of their Polish culture and community. Explore the collections of rare Polish dolls, antique toys and tools, pictures, and artifacts depicting the history of the Polish culture. Stop in the gift shop and check out the beautiful jewelry, fine china, and books before you continue to your next stop! Merchants National Bank was originally designed in the Prairie School style architecture in 1912. Admire the beautiful terra cotta and original stained glass featured throughout the structure, then take a look at the impressive murals of farm scenes on the interior. In 1974, the Merchants Bank was added onto the National Register of Historic Places. Today, explore beautiful architecture, discover the history, and then visit the African Safari Museum located comfortably inside. Church of St. John Nepomucene: The Basilica of St. Stanislaus Kostka is a historic church in Winona and a prominent fixture in the town’s skyline. The Basilica is listed on the U.S. National Register of Historic Places and was designated as a Minor Basilica of the Roman Catholic Church by Pope Benedict XVI. Thank you for cruising with us! We hope that you had a memorable experience and look forward to welcoming you aboard in the future. Enjoy nearby Minneapolis at your leisure or consider a Post-Cruise Premium Shore Excursion with airport transfer. Port taxes of $199 per person are additional and not included in the prices shown above.